In the year 1993, Infinity Marketing was simply an idea in the mind of an aspiring entrepreneur. 25 years later, the company is known as one of the leading full-service digital marketing agencies in the South Carolina region and continues to expand in its capabilities. 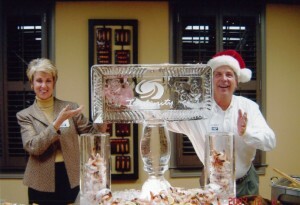 The company has acquired 25 years’ worth of memories; accomplishments and accolades as well as team member adventures. 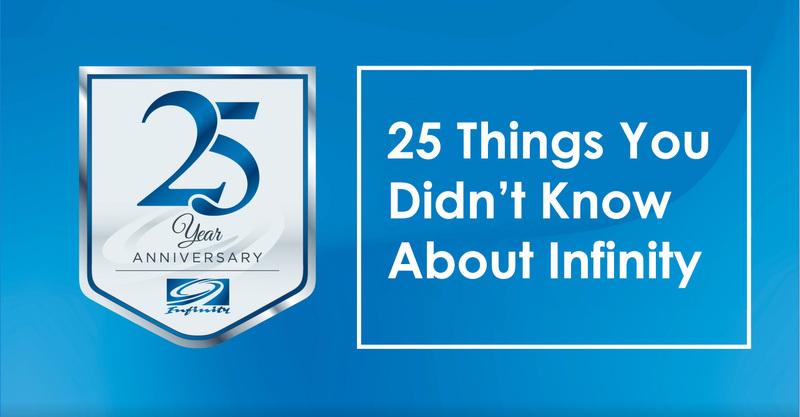 Among all of these reflections, there are facts about Infinity Marketing that you may not be aware of. Take a walk with us down memory lane and see how much you REALLY know about our agency. 1. Infinity’s original office was established in our founder Tony Williams’ own home. 2. Infinity’s very first client was Southern Wesleyan University, formerly Central Wesleyan College. 3. Infinity feels like one big family, and part of this might be attributed to the fact that there really are family ties within the company! We’ve got parents, children, siblings, and spouses that work together. 4. At Infinity, we have incorporated the Clifton Strengthsfinder program into our company culture. This focus helps us recognize that we all shine differently, and we can capitalize on the areas where we are strong, while partnering up with others where needed. Tony Williams has always said, “Hire to your weakness,” and his philosophy along with this program perfectly illustrates that it takes many different colors to make a complete box of crayons. 5. The agency is currently doing business in over 40 states across the United States. 6. Infinity is a Google Premier Partner, which means the agency specializes in Search, Mobile, Video, Display and Shopping Advertising as well as implementing Google Best Practices under account performance standards. This places our agency in the top three percent in the country that obtains this title; a huge honor! 7. Infinity is one of the few agencies to manage a DJ influencer program nationally, and we currently work with over 1,000 DJs across the country. 8. The conference rooms in our current office are named after each location that Infinity has been housed in relevance to the size of the facility. From smallest to largest, we have Pettigru, McBee, and Cleveland. 9. Infinity’s previous office locations both had unique attributes; Pettigru was haunted and Cleveland was so small that people had to work in closets due to the fact that it was shared with a bank vault. Let’s just say our employees were able to collaborate with ease. 10. The agency has a heart for supporting local charities, including Generations Group, Greenville Tech Foundation, Cancer Survivors Park Alliance, the Leukemia Lymphoma Society of SC, and the Julie Valentine Center, to name a few. 11. Infinity’s EVP of Operations, Tim Morrison was a client of the company prior to joining the team in 2004. We must have made a big impression! 12. Infinity thrives on team building opportunities; from companywide outings to monthly sponsored luncheons, it’s pretty obvious we love to spend time together and have fun. 13. A couple of employees from Infinity have started their own podcast – if you’re into professional wrestling, you may want to check it out! 14. We have an established internship program that gives opportunities for each of our departments. Over 15 of our interns have been hired as full-time employees, and we love having them grow and share their ideas with us! After all, they are our future. 15. Since its inception, Infinity has won numerous awards through various competitions for our client work. 16. We’re a little famous for our rockin’ Christmas parties; we even celebrate for a whole week with Christmas theme days to get into the spirit! 17. Our CEO has a strong health and wellness philosophy and provides us with fresh fruit daily, but we like to splurge a little with donuts every Friday. 18. The company’s size has grown to over 70 and counting with employees working in South Carolina, North Carolina, and Mississippi. 19. Prior to his creation of Infinity, Tony worked as a radio sales consultant by day and a media planner by night. 20. The Infinity crew once rented a party bus to attend two different team members’ weddings occurring on the same day. Now that’s dedication! 21. We have several multicultured employees that hail from nations all over the world, Ecuador, Brazil, and Australia to name a few. Some are even bilingual! 22. The Infinity logo was once made into an ice sculpture. See below! 23. We have an area of the office known as “the bat cave,” but we can’t tell you about it. 24. We sure do love our sports, from Fantasy Football leagues to college basketball brackets. Plus, we will challenge anyone to a game of ping pong. 25. Our tagline is “Endless possibilities,” and it could not be more accurate.